Looking for a wonderful new appetizer recipe? 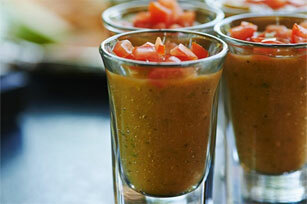 Our Ratatouille Shooter recipe is a must try! It's not only delicious, but a great make-ahead appetizer for your next party. Heat oil in large saucepan on medium heat. Add fresh vegetables; cook 8 min. or until tender, stirring occasionally. Add garlic; cook and stir 2 min. Blend soup, in batches, in blender until smooth, returning each puréed batch to saucepan. Cook on medium heat 3 to 5 min. or until heated through, stirring frequently. Add cream cheese product; cook and stir 3 min. or until cream cheese is completely melted and mixture is well blended. Spoon into 24 shot glasses, adding about 2 Tbsp. to each. Top with fresh tomatoes. Garnish each filled glass with sliced fresh basil before serving. Prepare soup as directed; cool completely. Refrigerate up to 2 days. Reheat just before serving as directed.